Recognised as a Rajasthan speciality, Dal-batti-churma, is a wholesome Rajasthani meal. 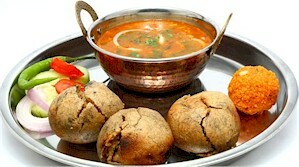 Dal, or lentil curry, is served with Bhatti, a roundel of stuffed flour that's baked in a charcoal fire or oven. Choorma is a sweet dish made with flour, jaggery or sugar and ghee. Bhatti comes in varieties acts as a substitute for rotis. You could opt for plain batti, or try the more exotic masala, dry fruit or missi battis. 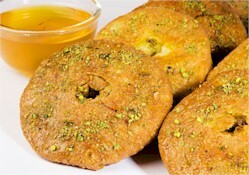 Batti is made out of wheat, flour, millet or a mix of maize and wheat flour, with loads of ghee. 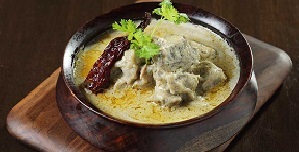 Lal Maas contains spicy, mouth-watering tanginess of a traditional Rajasthani dish. A red, spicy meat curry that's straight out of the Royal kitchens of Rajasthan, this dish is prepared using prime portions of mutton that's marinated in curd and spices. The dish is a result of the extreme heat and limited access to water that was prevalent in this region. Its unique preparation style serves the purpose of preserving it well after it's cooked and the spices enhance ones immunity and metabolism. Lal Maas is best relished with rotis and rice. A delicious lamb curry, Safed Maas literally translates into 'white meat' and is also known as the Royal Lamb Korma in most Rajasthan homes. The flavour of this dish lies in the perfect amalgamation of spices like onion, ginger, garlic, pepper and cardamom in its creamy white sauce curry. A favoured rice dish of Rajasthan, Gatte ki Khichdi or Ram Paulo as it is known, is a rice dish whose creation is credited to the scarcity of green leafy vegetables in this desert region. Gatte ki Khichdi is prepared with spices, green peas, boiled/fried besan dumplings and aromatic rice. These flavours blend into a mouth-watering, flavourful meal that is traditionally served with a chutney or curd on the side. This popular spicy snack is enjoyed especially in in Jodhpur during monsoon. It is prepared by splitting a mirchi (green chilli) and stuffing it with spices, a layer of mashed potato and gram flour. The green chili is first fried with the potato and masala and then deep fried with the gram flour over it. Chowdhry and Surya Namkin's Mirchi bada, and the Raju Mirchi bada are a few variants of this dish that are local favourites. Rajasthan has always been a haven for the adventurous foodie, and one must experience the journey of flavours of this royal state. Unique to the arid land of Rajasthan, Ker Sangri is a delectable amalgamation of ker, a shrub berry and sangria, a bean of the Khejari tree. Cooked simply with ingredients such as red chillies, carom seeds and spices, this bean and berry vegetable is flavourful, tangy and delightful. It is considered to be one of Rajasthan's most authentic gourmet preparations and is a must at Marwari wedding celebrations.